A strong root system is the secret to maintaining a healthy lawn throughout the growing season. Promoting a healthy root system is best achieved with proper fertilization techniques which start with quality fertilizing products. Rocscape Landscaping uses Lesco professional brand fertilizers that are made by John Deere. What that means for you? High quality results. Lesco’s granular fertilizers are developed to release nutrients evenly over time, unlike the retail versions that are available at the big box stores. The granules in the fertilizer have a coat which release nutrients as it dissolves slowly in the soil to continuously supply the roots with the necessary nutrients to stay strong and healthy. Contact us today we serve Beachwood , Chesterland, Gates Mills, Highland Heights, Lyndhurst, Mayfield Heights, Mayfield Village, Moreland Hills, Orange, Pepper Pike, Richmond Heights, South Euclid and Willoughby Hills. 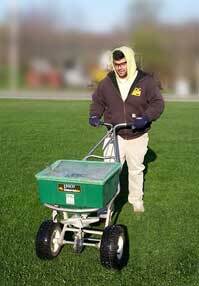 We provide a complete lawn fertilization program from spring to fall. All treatments are applied by licensed technicians. Our 5 step lawn fertilization program will keep your lawn green and properly fed all season long. Step 1 – Crabgrass pre-emergent and feeding (March – April). Step 2 – Broadleaf weed control and feeding (May – June). Step 3 – Surface bug control and feeding (June – July). Step 4 – Lawn feeding (July – August). Step 5 – Winterization feeding (October). • Season long grub prevention (One time). • Driveway and sidewalk crack weed treatment – Completed on the same schedule as 5 step fertilizing (5 applications). • Weed treatment for landscape beds – Completed on the same schedule as 5 step fertilizing (5 applications). Thank you for visiting. Please browse our website and come back often as we will be continually adding information. If you do not see what you're looking for, please fill out our, Information Request Form below or call us today at 216.409.4040. ©2013-2015 RocScape Landscaping, LLC. All Rights Reserved.